With its innovative and elegant two-motor hybrid powertrain, the 2014-2015 Accord Hybrid set the benchmark for a mid-size hybrid sedan in refinement, advanced technology and class-leading fuel efficiency. 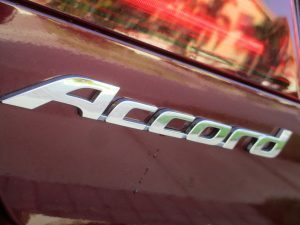 The 2017 Accord Hybrid moves even further ahead of its competitors with the application of a second-generation two-motor hybrid system, providing even greater fuel efficiency and class leading total system horsepower while benefitting from the styling and technological enhancements made to the Accord lineup for model year 2016. 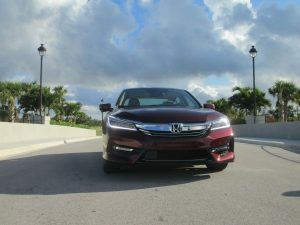 From an Accord family perspective, the new Honda Accord Hybrid is the ultimate Accord, the most refined, technologically sophisticated and, of course, most fuel efficient model in the lineup. 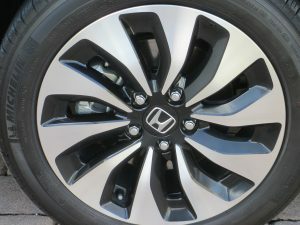 Celebrating its 40th anniversary this year, the Accord has set the benchmark for vehicles in the midsize sedan class. Accord is widely recognized as a segment-defining product, delivering class-leading interior space and superior ergonomics along with outstanding fuel efficiency, refined and responsive driving dynamics and top-class safety performance. 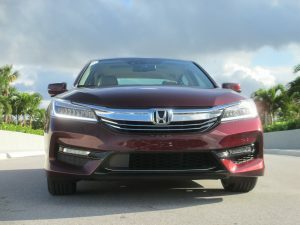 This is what has made the Accord America’s most popular car for five of the past six years and for the last three years running, and the best-selling midsize car to buyers under 35 years old for the past four years. 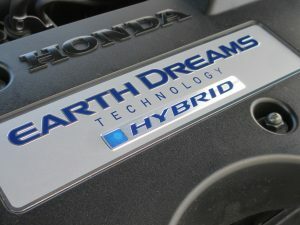 Combining the next generation of Honda’s two-motor hybrid system with an ultra-efficient 2.0-liter i-VTEC Atkinson Cycle engine, the 2017 Accord Hybrid powertrain will achieve peak combined output of 212 horsepower, the highest of any midsize hybrid sedan and up 16 horsepower over the 2015 Accord Hybrid. 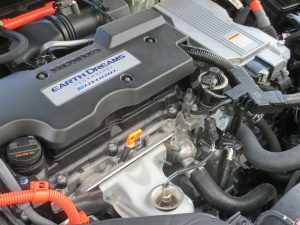 EPA fuel economy ratings of 49/47/48 (city/highway/combined) put the Accord Hybrid at the top of the class for ratings, making it the most powerful and fuel efficient midsize hybrid sedan in America. These EPA fuel economy ratings are based on new, more stringent ratings requirements enacted by the U.S. EPA for the 2017 model year. 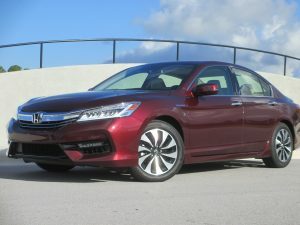 Based on the new requirements, Honda estimates the 2015 Accord Hybrid ratings would be 48/45/47 (actually rated at 50/45/47 under the previous method), indicating a +1/+2/+1 increase for the 2017 model over the previous version. 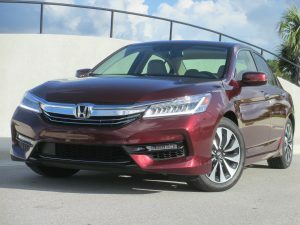 The Accord Hybrid gets a major facelift for 2017 that closely follows the changes made to the gasoline-only powered 2016 Accord models. In place of the previous wrap-around front bumper is a more sharply creased and intricately structured front fascia, the lower portion of which tucks into large intake-like meshed areas that house new standard LED fog lights. An Accord Hybrid exclusive, elegantly contoured aluminum hood meets up with a brighter, more pronounced front grille. 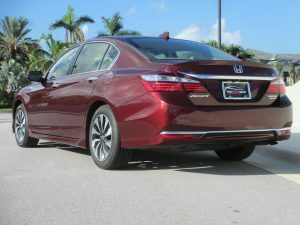 The new more expressive face of Accord is complimented by a sharply sculpted rear bumper fascia and new LED taillight design. 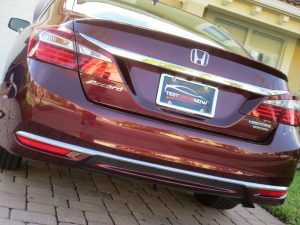 Blue-accents on the front grill, headlights and taillights of the 2017 Accord Hybrid, along with special “Hybrid” badging, provide a subtly distinctive look and visual differentiation between from its gasoline-only powered stable mates. The 2017 Accord Hybrid’s sportier design is matched by its improved dynamic performance. New higher performance Amplitude Reactive dampers and a retuned electric power steering system combine to deliver an even more linear and compliant ride and precise handling response. Body and chassis upgrades also improve NVH, particularly with reduced noise and vibration at low engine speeds and reduced engine noise at higher engine speeds. All 2017 Accord Hybrids also feature a standard Multi-Angle Rearview Camera. The Touring trim adds new auto high-beam headlights that enhance nighttime visibility and driving convenience. 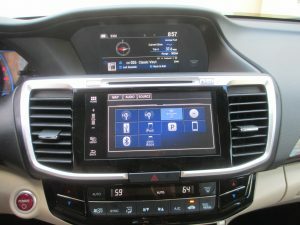 The 2017 Accord Hybrid audio and digital experience is also significantly upgraded with the application of a new 7-inch touchscreen Display Audio interface (EX-L and Touring trims) featuring Apple CarPlay™ and Android Auto™, as well as newly available HondaLink Assist (e911), Satellite and HD Radio®. Smartphone pairing is now simplified with a single USB cable connection, no longer requiring an HDMI cable connection. The new Display Audio system serves as the interface for new Apple CarPlay™ and Android Auto™, offering a multitude of new functions and features, including smartphone-linked navigation (Apple Maps or Google Maps), audio streaming, voice-controlled SMS text messaging and more. 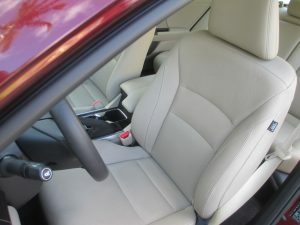 The lower 7-inch Display Audio touchscreen is paired with an upper 7.7-inch display screen and steering-wheel controls. The upper screen can display audio settings, turn-by-turn directions (from embedded navigation when so equipped or from Android Auto™ or Apple CarPlay™ navi apps), time and trip information (e.g. 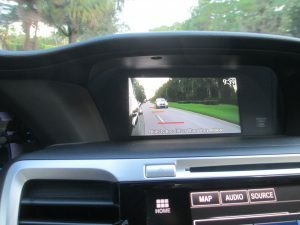 range, trip distance), LaneWatch and Rearview Camera displays, incoming calls, SMS text messages, and parking sensor alerts. 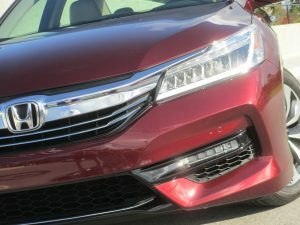 •Honda Sensing™ technologies including Lane Keep Assist (LKAS), Road Departure Mitigation (RDM) with Lane Departure Warning (LDW), Adaptive Cruise Control (ACC), and Collision Mitigation Braking System (CMBS) with Forward Collision Warning (FCW). 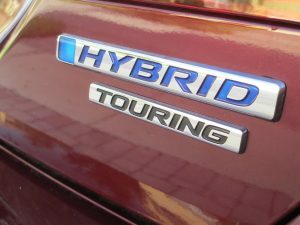 The 2017 Accord Hybrid features a significantly reengineered second-generation two-motor hybrid, Intelligent Multi-Mode Drive (i-MMD) powertrain. The i-MMD system received numerous changes that reduced the physical size and weight of components and increased efficiency to provide more power and improved fuel efficiency as well as increased cargo capacity. Total combined horsepower is up 16 hp to 212 horsepower and EPA fuel economy ratings were raised to 49/47/48 (city/highway/combined). These EPA fuel economy ratings are based on the new more stringent ratings requirements enacted by the U.S. EPA for the 2017 model year and cannot be directly compared to the figures for earlier model Accords or competing vehicles. 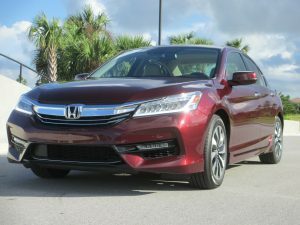 Nevertheless, when compared using the same criteria, the 2017 Accord Hybrid bests the 2014/2015 model in all ratings. 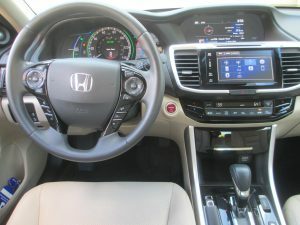 In keeping with Honda’s commitment to safety, the 2017 Accord Hybrid is the first Honda vehicle to have as standard equipment the Honda Sensing™ suite of advanced safety and driver-assistive technologies. Honda Sensing™ is designed to expand the driver’s situational awareness while sensing and responding to potential road hazards, including other vehicles, road obstacles and even pedestrians, even to the point of mitigating the possibility or severity of a collision. 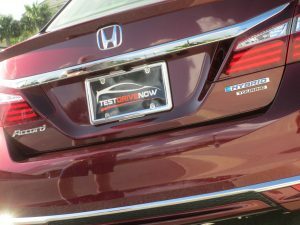 The 2017 Accord Hybrid is expected to receive the highest safety ratings – a 5-Star Overall Vehicle Score from the National Highway and Traffic Safety Administration (NHTSA) New Car Assessment Program (NCAP) crash tests.